Managing a sophisticated commerce marketing program requires more than a simple email marketing platform. Say goodbye to batch and blast messages and hello to relevance. Today's commerce marketers use an average of 7.2 marketing tactics to grow their businesses to keep shoppers coming back for more. Are you ready to add a few to your toolbox? 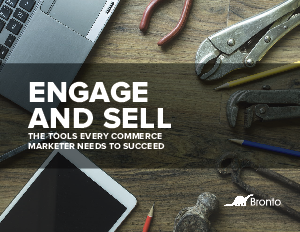 In this e-book, we'll explore seven readily available commerce marketing tools and highlight the experiences of marketers using these tools to increase revenue and engagement.